Focusrite Audio Engineering Ltd. and Audient Ltd., both of the UK, announce an agreement whereby Focusrite will commence the production and sale of certain Audient product designs. 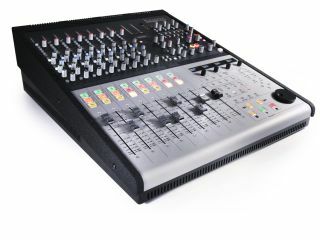 The first product to be released under this agreement is the Focusrite Control 2802 Dual Layer Mixing Console. Phil Dudderidge, Chairman and Managing Director of Focusrite comments: "The 2802 is a superb analogue mixer and DAW controller in one tidy package; designed to a highly professional standard. Dave Dearden is a designer I have known and worked with since the 1970's and he is one of the few analogue mixer gurus still working, with a team around him young enough to embrace the challenges of DAW control." David Dearden, Audient's Technical Director, adds, "Dual Layer is the result of a lengthy development project aimed at redefining the analogue console and we're very proud of the results. Establishing this new relationship with Focusrite means we can together deliver designs such as the 2802 to as many users as possible. Without question, Focusrite's formidable strength in global sales and distribution will help ensure that we maximise the potential of this technology." Under this agreement, Focusrite and Audient willcontinue to work together on developing and deliveringexciting new designs, bringing Dual Layer and other new technologies to a wider audience than Audient could access on its own. This in turn allows Audient to strengthen its position in the studio market and develop key new products, such as the ASP8024DLC, that use this same technology. Dudderidge continues: "Audient's design values reflect our own. We have been fortunate to build a head of steam over the past few years that enables us to address global demand levels. This agreement works well for both companies. We look forward to offering more products, co-developed by our respective engineering and product marketing teams." The Focusrite Control 2802 is a small-format recording console and a DAW control surface in one. It forms both the digital control nerve centre and the analogue heart of the modern professional project studio. Dual Layer Technology lets today's studio owner jump between analogue mixing and DAW control. In a single surface, the Focusrite Control 2802 integrates state of the art summing of 28 inputs, comprehensive monitoring, stereo master bus compression, and sophisticated control over every major DAW. Eight transparent class-A microphone preamplifiers and ultra low-noise analogue circuitry with extreme high-frequency extension throughout provide an audio path with uncompromised transparency and accuracy. Ethernet-based control places your favourite music software at your fingertips, while DAW and console automation truly takes your mixes out of the box. The best hybrid analogue console in its class, Focusrite's Control 2802 brings you the flexibility and elegance of a fully specified studio console, in a single desktop package. The Focusrite Control 2802, which will be available from June 2011, greatly complements the RedNet range of networked audio interfaces recently announced by Focusrite, available worldwide from Q4 2011.